As one of the Indian leading supplier of paper boxes, PrintWeekIndia specialize in providing gift boxes, corrugated boxes, rigid boxes, wine boxes, jewelry boxes, display boxes and folded boxes with the highest quality assured. Our gift boxes, rigid boxes and jewelry boxes are specifically cater for customers who require really eye-catching and exquisite retail packaging solutions. We’re proud to offer a versatile selection of custom boxes perfect for your retail packaging needs. We are cherished to count our paper boxes among our recycled products, and offer biodegradable products as well. Presenting our wide assortment of paper boxes that can be use for daily storage purposes ant their attractive designs can also be used for gifting in a new and innovative way. Our amazing range of paper boxes is available in different shapes, sizes, colors, patterns etc. 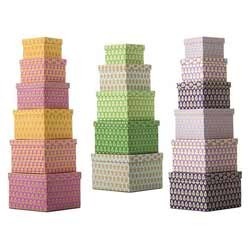 Offers paper boxes, handmade paper box, colored paper boxes, designer paper boxes, decorative paper boxes, wholesale paper boxes in India, paper crafts manufacturers in India. These high quality packaging boxes easily store dresses, gifts, shirts, lights, or any other product. We also provide our packaging boxes in customized sizes and specifications provided by the clients. Our range of packaging boxes includes paper packaging boxes, hard boxes, duplex boxes, hard packaging boxes, duplex packaging boxes, plain duplex boxes, printed duplex boxes, shipping boxes, embossed duplex boxes etc.